Wylie Huffman became the IRLC’s Executive Director in January 2018. He joins the IRLC after his recent retirement from serving 22 years in the U.S. Army where he culminated as the Republic of Korea’s Ground Army Commander’s Executive Plans Chief, responsible for leading diverse multinational planning efforts to integrate and synchronize air and ground operations across the Korean peninsula. Wylie joins the IRLC with vast experience in building and leading teams of professional subject matter experts that unify efforts, operations, and conceptual implementations to achieve a common vision. His background also includes several years of practical experience in strategic communications and community outreach. Wylie’s love of nature was nurtured as a child growing up on his family’s 110 acre farm near Columbus, Ohio where he spent his weekends and summers catching amphibians and reptiles, and raising orphaned wild animals to include squirrels, raccoons, Canadian geese, and crows. 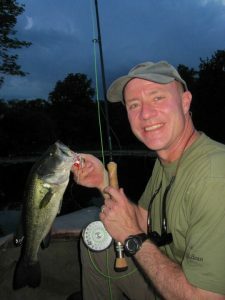 He developed a passion for flyfishing and appreciation for water quality at an early age by catching bass and panfish in the farm’s ponds and spring-fed creek. Wylie is excited and honored to be working within the Northern New York community to bring people together regarding environmental conservation efforts throughout the Indian River Lakes watershed. While spending a total of six years stationed at Fort Drum at different times in his career, he fell in love with the area’s abundance in natural resources and outdoor recreational opportunities and decided to “grow roots” here with his wife of 22 years and daughter (12) and son (10). These days, when not serving at the conservancy, Wylie can be found swinging flies with his family on the Salmon River during the fall and winter months and bass bugging the Indian River Lakes with his fly rod during the spring and summer.